Traditionally, children began orthodontics around the age of 12 to 14 years old. Orthodontists suggested that it was best to wait until all of the permanent teeth erupted through the gums. Sometimes, permanent teeth needed to be removed to make room for the orthodontic treatment. As more information has been learned, the American Academy of Orthodontics now suggests that children should have an orthodontic check-up by the age of seven. Interceptive orthodontics can be used at this early age to treat malocclusions in the early stages when they are diagnosed. Here at Clock Tower Dentistry, we offer comprehensive interceptive orthodontics treatments in Palatine, IL. One of the most common questions parents ask is why their child needs orthodontics at such an early stage. This treatment is usually the first stage of the overall treatment, with the second stage occurring after the permanent teeth have grown in. By beginning the treatment at a younger age, it is possible to reduce the time that is needed for the second phase or orthodontics. The interceptive orthodontics treatments might include an expansion of the jawbone to make room for all of the teeth, removing baby teeth to make room for permanent teeth, or adjusting the placement of permanent teeth as they erupt. Choosing these orthodontics treatments for your child helps with symmetrical facial growth as the jaw develops. These treatments are important to preserve space for permanent teeth that haven’t erupted yet, as well as expanding the palate so that the back molars are properly positioned. 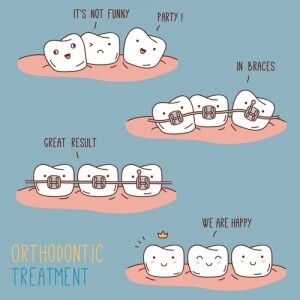 These orthodontic treatments offer more than aesthetic benefits. As the teeth are aligned, the treatments also help to improve jaw misalignment and malocclusions. Early treatment is always best for these conditions. If your child is a candidate for early orthodontics treatment, then you should talk to us at Clock Tower Dentistry to see if it is the right solution. Using these treatments at an early age can decrease the amount of time that your child will need to use orthodontics in their teenage years. Are you ready to learn more? Schedule a consultation with our team at to learn about interceptive orthodontics.